Waltzing Matilda: Happy Feast of St. Blaise! We love this feast day thanks to some family connections and the intercession of St. Blaise for a close friend who needed major surgery on her thyroid. We usually like to go to church and get our throats blessed today. Part of our family connection has to do with my grandpa. He loved to tell stories as I have mentioned before, but the one story he refused to tell in it's entirety was the story of this man. His name is Fr. Blasius and he was a Salesian priest who escaped the Communists in the former Czechoslovakia back in the 1950's, supposedly with a price on his head. (I don't know if all priests had prices on their heads back then or if his was special.) We are not sure if my grandparents helped him flee Europe or if they only became a part of his story once he reached America. Fr. Blaise spoke no English but Grandma and Grandpa both spoke English, Czech and some German. 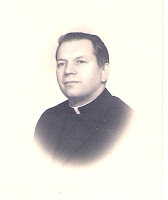 My grandmother taught him some English and my grandfather helped him to find an order of Salesians in New York. Sad to say that is about all I know of the story. I think my grandfather was reticent to discuss the whole story because he was worried about retribution from the Communists which sounds laughable, but the world was different then. I am sure there is more, but two of the three people who would know best have passed from this world and the third hasn't returned any correspondence for a while. We knew that Fr. Blaise made it back to Europe and even returned to his beloved Czech Republic. Stories of people like these can and have filled volumes. They truly deserve to be called The Greatest Generation. 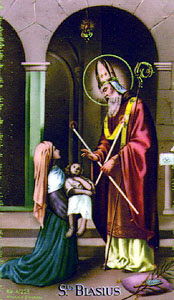 O glorious Saint Blaise, who by thy martyrdom didst leave to the Church a precious witness to the faith, obtain for us the grace to preserve within ourselves this divine gift, and to defend, without human respect, both by word and example, the truth of that same faith, which is so wickedly attacked and slandered in these our times. Thou who didst miraculously restore a little child when it was at the point of death by reason of an affliction of the throat, grant us thy mighty protection in like misfortunes; and, above all, obtain for us the grace of Christian mortification together with a faithful observance of the precepts of the Church, which may keep us from offending Almighty God. Amen. I love your St. Blaise entry! Growing up my mother would waltz us to the parish on St. Blaise's Feast Day to get our throats blest. I tried to remember every year but usually forget, even with a Catholic Calendar. But, last year I did remember. Thanks to your family for helping our persecuted religious. There are too many even today.